This post originally appeared on http://www.crs.org/stories/earth-hour-sheds-light-5-grim-climate-facts Climate change affects lives each day around the globe. 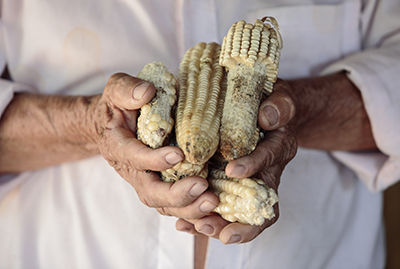 From summer heat waves to drastic floods, it touches the wealthiest individuals living in modern cities and the poorest in developing countries. The effects of climate change can reach far beyond the expected ecosystems, economic sectors and populations. On March 19, from 8:30 to 9:30 p.m. local time, cities, landmarks and businesses around the world will turn off their lights for one hour. The goal of this Earth Hour is to highlight climate change dangers. Climate change is happening now, and predictions for the future are grim. Events influenced by climate change took 12,994 lives in 2015. This startlingly high number, provided by the International Disaster Database at the Center for Research on the Epidemiology of Disasters, is up from 8,056 in 2014, showing just how dangerous climate change is becoming. There is a pressing need to adapt to climate change in order to protect lives threatened by droughts, fires, heat waves, storms, floods and landslides. The total monetary cost of events influenced by climate change in 2015 was $74.6 billion. This data from the International Disaster Database highlights the huge economic impact. Besides the social, physical, and environmental needs, among many others, to mitigate and adapt to minimize future damage, there is an increasing economic need as well. 90% of the recorded natural disasters from 1995 to 2015 were influenced by climate and weather. According to the U.N. Office for Disaster Risk Reduction, the United States had the highest number of disasters, followed by China, India, the Philippines and Indonesia. 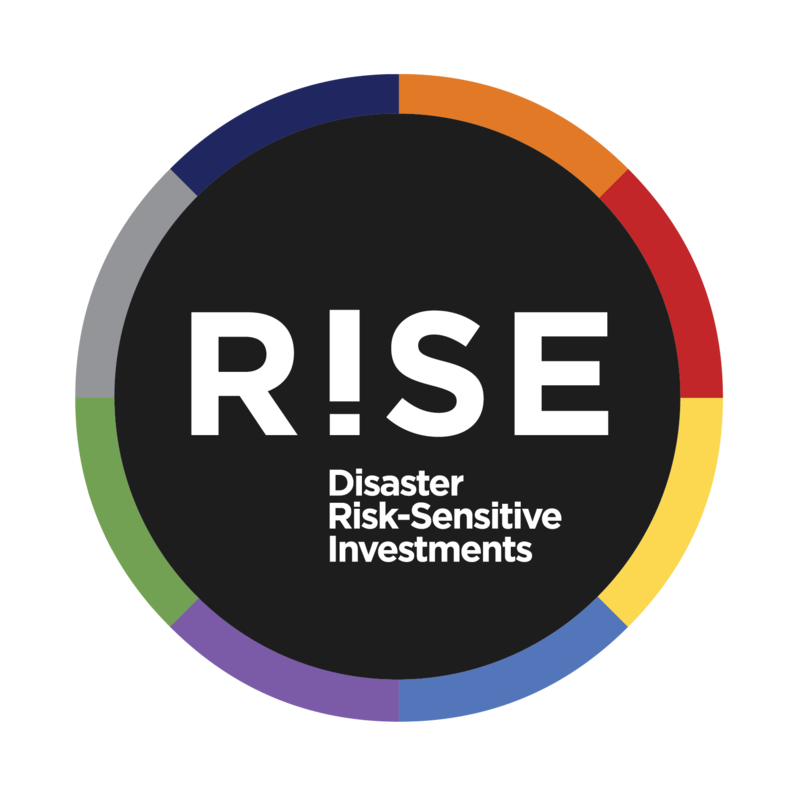 Resilience and disaster planning are needed to reduce risks and mitigate impacts of floods, heat waves, droughts and other potentially catastrophic climate-related events. With no action, climate change costs and risks will accumulate to an equivalent of an annual loss of at least 5% of global GDP. A report by Jonathan M. Harris, Brian Roach and Anne-Marie Codur at Tufts University, “The Economics of Global Climate Change,” predicts losses of land area, species and forests; and water supply disruption, increased human health dangers and drought. These changes—affecting biodiversity, agricultural production and human survival—will likely be irreversible. Other, less predictable, effects may include changing weather patterns, rapid melting of major ice sheets and glaciers, and an increasing rate of global warming. The total annual cost of climate change on human health will total about $2 to $4 billion by 2030. This estimate from the World Health Organization accounts for the detrimental effects of climate change on vital basic resources, such as clean air, safe water, adequate nutrition and protective shelter. WHO also estimates 250,000 more deaths will occur annually between 2030 and 2050 because of climate change. These numbers underscore the great sense of urgency to act against climate change to protect innocent lives. Author: Joyce Coffee is managing director of Notre Dame Global Adaptation Index. Patricia Holly, a University of Notre Dame student, contributed to this article. In 2016, the World Economic Forum’s Global Risks Report concentrates on the likelihood and impact of environmental and societal risks. Three of the top five most likely risks are environmental, including failure of climate-change mitigation and adaptation ranking as 3rd most likely and as the most potentially impactful. This year is the first time in almost ten years that an environmental risk has ranked first in terms of impact. Water crises and involuntary migration also rank in the top five for most impactful risks in 2016. Over time, climate-related issues have increasingly ranked higher in potential impact and likelihood of occurrence in this vanguard report.. These risks feature prominently in the highest concern list for the next 18 months. 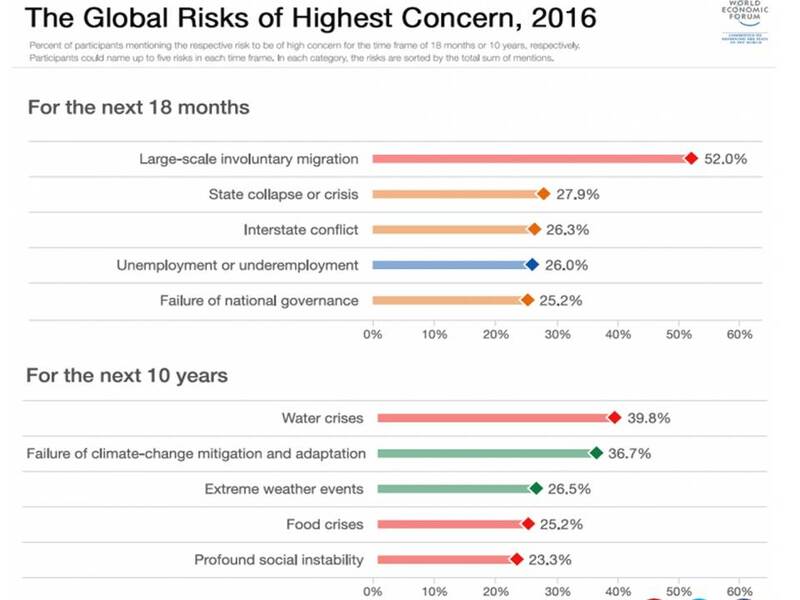 And, with a longer term view over the next ten years all five of the risks of highest concern relate to climate change: water crisis, failure of mitigation and adaptation, extreme weather events, food crisis and profound social instability importance of climate-related events. The report presents many risks that are interconnected, such that they may be mitigated or aggravated by the same action or event. Climate change, as a trend, is heavily weighted, indicating strong connections with many other risks, including extreme weather events, water crises, biodiversity loss, and ecosystem collapse. These data indicate a need for nations, as well as businesses and local governments, to collaborate to address climate change – especially to implement and measure adaptation projects. Important questions are now presented to the world. Climate change must clearly become a global priority, but what is the best way to go about both mitigating it and, adapting to it? Some of those questions were addressed in the Paris Decision and Agreement, where a mitigation target is on par with not only a global adaptation goal, but also the humbling Loss and Damage. With Loss and Damage an official part of the agreement and the educated elite that participate in WEF’s survey defining major risks as the lack of adaptive capacity, there is a resounding clarion call to create adaptation actions in water and food security today that save lives and improve livelihoods. Thanks to Patricia Holland, ND-GAIN Intern, for her help with this blog. Editor’s note: This is the second post in an ongoing biweekly series on the climate adaptation gap. Stay tuned for future installments here on TriplePundit! In case you missed it, you can read the first post here. Previously, exploring the chasm between the need by corporations to adapt to climate change and the apparent absence of leadership to do so, I addressed a five-part plan for companies to become climate adaptation leaders. Let’s delve into the first two, offering suggestions to ensure corporate resiliency in a climate-altered world. Why does this matter? For the past several years, the CDP’s supply-chain survey has revealed that more than 70 percent of corporate respondents envisioned risks to their supply chain from climate disruption. Indeed, these risks are appearing. Thailand’s unprecedented 2011 flooding alone caused $20 billion in economic losses. Honda’s losses alone totaled more than $250 million when flood waters inundated an auto assembly plant. In another climate-related disruption in Mexico, General Motors calculated that a one-month disruption at one of its production facilities there hard hit by drought could spark a $27 million loss in profits. The secret involves knowing first where your supply chain starts. That’s another kind of gap for many corporations–and one that myriad sustainability surveys and shareholder proxy fights face. But let’s presume that, like a majority of global corporations, you are getting a handle on your supply-chain geography to examine both risks and opportunities for your bottom line. That’s the first step of addressing your climate adaptation gap: Examine the relative risks of geographies in your supply chains. Many tools are available for corporate and development decision makers to help plan and devise their business strategies. Corporate leaders tell me they use the Consumer Confidence Index, Corruption Perceptions Index and Human Development Index, among other well-regarded tools, to help relay complex information quickly to their boards of directors and C-suite peers. Some global corporations maintain tools themselves. MWH Global, an early employer of mine and a leader in hydropower development worldwide, including in the least-developed countries, developed an internal risk-management schema that helped it consider the hardship to employees working in less-stable countries. The ND-Global Adaptation Index, or ND-GAIN, is another business barometer that provides quick insights into a country’s climate vulnerability and readiness to adapt. And since risk experts rank climate change among the principal threats to business, the tool serves as a timely resource for strategic planning. Free and open-source, ND-GAIN illuminates the countries best prepared to deal with global changes sparked by overcrowding, resource constraints and climate disruption. This index uses 17 years of data to rank over 175 countries annually against 50 variables, based on how vulnerable they are to droughts, super-storms and other natural disasters and, uniquely, how ready they are to employ adaptation solutions. Click this photo to check out the vulnerability/readiness matrix and compare countries. The ND-GAIN ranking (pictured right and above), which orders every country by aggregating all measured factors into a single score. It allows a quick look at combined vulnerability and readiness. View the full rankings to find your countries within the index and compare their ND-GAIN ranking with one another. ND-GAIN’s assessment of the Philippines. Click to enlarge. The ND-GAIN Country Profiles (pictured right) provide all of the data and their sources, organized by specific vulnerability and readiness measures such as water availability, food security and education level. These country profiles for the 175 countries in the index help you to identify relevant vulnerabilities in geographies where you maintain significant human and capital assets. What’s vital about these country profiles is that they give the private sector the means to gauge adaptation-related opportunities and risks in developing countries. With this ability, the private sector can address the critical needs of vulnerable populations (and identify new markets well-suited to their business model, products or services and investment-risk profiles). The profiles also help policymakers identify the easiest-to-achieve avenues – that proverbial low-hanging fruit – for improving rapidly a country’s investment attractiveness to the private sector as well as to motivate and create incentives to employ the best public policies. Joyce Coffee is managing director of the Notre Dame Global Adaptation Index (ND-GAIN). Coffee, who is based in Chicago, serves as the executive lead for related resiliency research, outreach and execution. Stay tuned for the next post in “The Climate Adaptation Gap” series on Tuesday, June 3. The series will deep-dive into the complicated look at supply chain risk assessment. Next up: “Relevant Vulnerabilities in Geographies”. Portions of this article first appeared on http://climageadaptationexchange.com. Editor’s note: This is the first post in an ongoing biweekly series on the climate adaptation gap. Stay tuned for future installments here on TriplePundit! Joyce Coffee, Notre Dame Global Adaptation Index Managing Director, opens last year’s ND-GAIN Annual Meeting. Since climate adaptation relates to the direct impacts on our most important assets—our employees, our customers, our communities and our families–those who advise corporations possess a great opportunity to demonstrate to their clients the significant collateral benefits of a five-step plan of adaptation action. The five steps are outlined briefly here, and will be rolled out in-depth throughout a six-part, biweekly series on Triple Pundit.